Don’t Let Fake Health & Nutrition Articles Derail Your Diet! Confused by conflicting health and nutrition advice? We’ve got some tips to help you make sense of it all. There’s been a lot of talk about fake news lately, but it’s nothing new. The diet industry has been touting questionable claims forever, and there’s a constant stream of conflicting health and nutrition articles popping up in your newsfeed. Coffee is good for you, coffee is bad for you, skim milk vs whole, margarine vs butter, juicing vs blending…it’s a warzone out there. So how do you know what to trust, and what to take with a grain of (pink-Himalayan-Kosher-flaked-sea) salt? 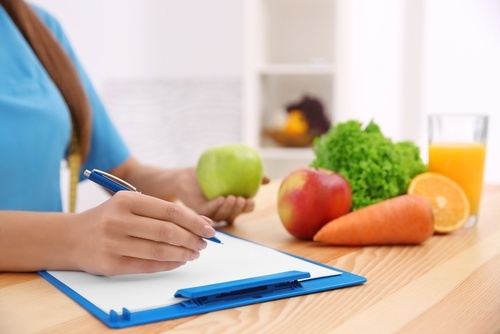 March is National Nutrition Month, so what better time to learn how to sort through the nonsense and find nutrition tips that are worth using? Let’s find out why health and nutrition advice can be so contradictory, and what you can do about it. 1. Nutrition Science is a Baby: As sciences go, “nutrition science” hasn’t been around very long. Some of the most controversial topics, like trans fats and artificial sweeteners, have only been on the radar for a couple of decades. To become an accepted part of the science community, a study has to be performed and find the same results many, many times. This is why it takes so long for definitive information. For example, remember the old food pyramid? It recommended 6-11 “grain” servings each day. Not only is that a pretty large gap, but it counts refined grains like white rice and bagels, and whole grains like brown rice and oatmeal as equals, which we know now is incorrect. Today’s new dietary guidelines, “MyPlate” reflects nutrition science’s latest conclusions – recommending that fruits and vegetables make up half of your plate, and that whole grains comprise half of your daily grain intake. What Can You Do? Don’t treat any new health and nutrition articles like a “be all, end all.” Be conscious of the ever-evolving nature of the science, and don’t revolutionize your entire eating style because of one new study. Hyping up small studies with scintillating headlines gets a lot of results on social media, but not so much in real life. What Can You Do? Go ahead and click on the tempting headlines, but read the entire article, and find out what the complete results of the study were. Be wary of health and nutrition advice that’s presented without credible experts like an actual medical doctor. Unfortunately, even registered dieticians can vary widely in their advice. The old adage, “If it’s too good to be true, it probably is.” applies here. Anything that promises “fast” weight loss, claims any one nutrient can solve everything, or that recommends cutting out an entire food group, should raise red flags in your mind. 3. Follow the Money: Keep in mind that the health and nutrition industry is an industry. While there are plenty of credible experts in the industry, there are also people who make a living pushing specific products and diets. Some of these people may have found legitimate success with their products, but that doesn’t mean it will work for everyone. Similarly, look into who is funding the studies you’re reading. For example, “The Gatorade Sports Science Institute” publishes papers stating that Gatorade is better than water during exercise, despite clear evidence to the contrary. What Can You Do? Do your homework. Ask yourself, “What are this person’s qualifications?” “Who paid for this study?” and “Are they trying to sell me something?” Beware of anyone pushing nutrition tips that involve buying their brand of supplements or diet program. Read our blog to stay up to date on the nutrition tips you should know.